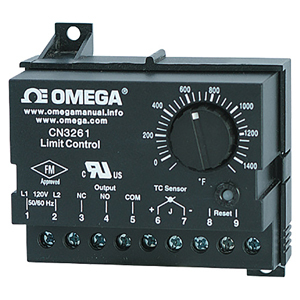 The CN3261 Series High Limit Controller protects expensive heaters and sensitive materials from damaging over temperature conditions. It is designed for industrial and commercial applications that require high temperature protection. The CN3261 features a Form C latching, manually resettable relay output that de-energizes whenever the sensed temperature exceeds the setpoint temperature.Two methods are provided to reset an alarm condition. (1) The Limit alarm has a reset pushbutton on the unit and (2) Reset terminals are provided for resetting the alarm from a remote pushbutton. The DIN Rail mounting feature allows quick installation without drilling or extra hardware. Slots are also provided for direct panel mounting.